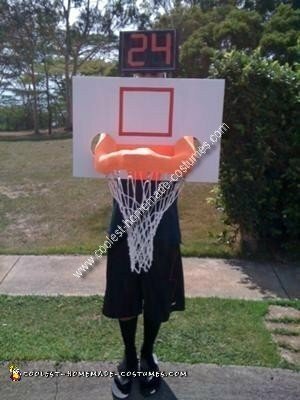 Materials I needed: Foam white board, Basketball Net, Name-Tag Clips, Head Band, black foam sheet, Orange tape, Orange Tights, Red tape, and Print out of a Shot clock. 1) Measure and cut arm holes. 2) Cut hole in tights to fit head through. 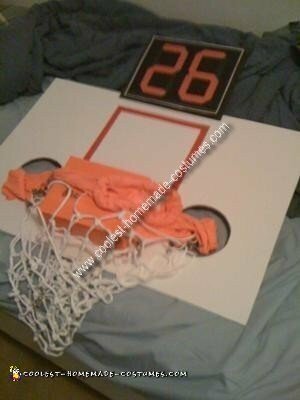 3) Print out Shot Clock (*26 in there, but later did some Photoshop work to make it read 24). Then staple cardboard to the back of it. 4) Measure and tape red box on board. 5) Add name-tag clips to the net and then connect to tights. 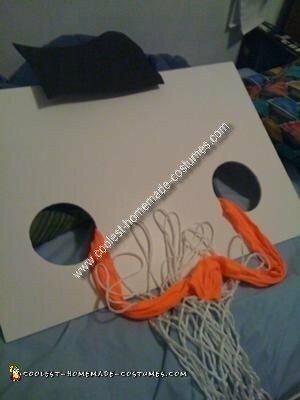 6) Tape bottom of backboard (base of the rim) with orange tape. You are AMAZING, lol. I love the part about using the bathroom..
Looks great. Original idea. One question… how did you see?